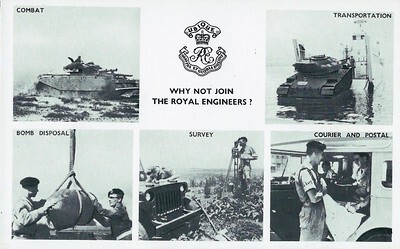 Why not join The Royal Engineers Recruiting Card (Assault Bridging version) BFPS 1000. 18 June 1967. Assault Bridging version. The R.E. 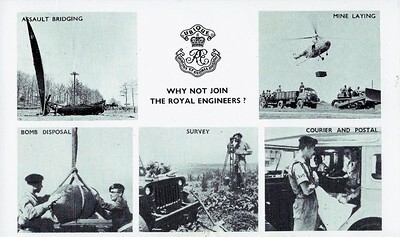 Cypher and the words "Why Not Join The Royal Engineers?" 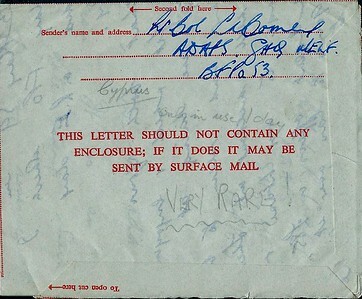 have been blanked out and BFPS 1000 stamped over a 4ᴰ Machin definitive stamp. 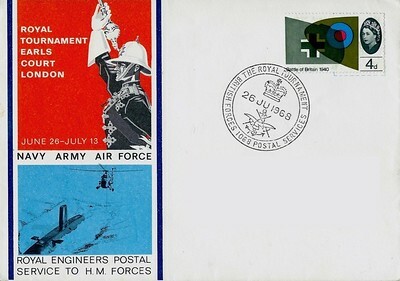 Royal School of Military Engineering Chatham - 1967 Generic First Day Cover. Visit of H.M. 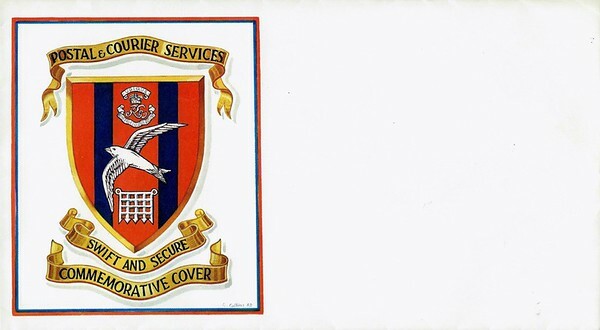 The Queen Malta Services Week November 1967 Postal & Courier Communications R.E. Type: Commemorative Cover Stamps: 4ᴰ Machin definitive, dark sepia. 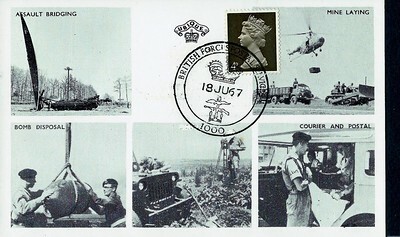 Special Handstamp: BFPS 1000, 17 NO 67, Crown and Tri-Service symbol in the centre. Maltese Special Handstamp: Malta Services Week 18 NOV 1967. Visit of H.M. The Queen Malta Services Week November 1967 Postal & Courier Communications R.E. Type: Commemorative Cover Stamps: 9ᴰ Machin definitive, green: 2ᴰ and 4ᴰ Maltese issued commemorative stamps. 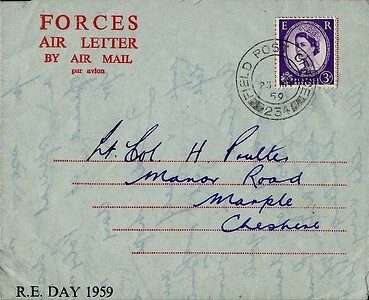 Special Handstamp: BFPS 1000, 17 NO 67, Crown and Tri-Service symbol in the centre. Maltese Special Handstamp: Malta Services Week 18 NOV 1967. Royal Tournament Earls Court London June 26 - July 13 Royal Engineers Postal Service to H.M. Forces Commemorative Cover Stamps: 4ᴰ "Wing-tips of Supermarine Spitfire and Messerschmitt Bf 109" commemorative, issued 13 September 1965. Special Handstamp: The Royal Tournament BFPS 1068, 26 JU 1968, Crown and Tri Service symbol in the centre. 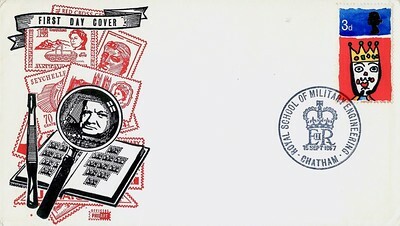 Ulster Tattoo Commemorative Cover Stamps: 4ᴰ Machin definitive, deep sepia, issued 22January 1968. 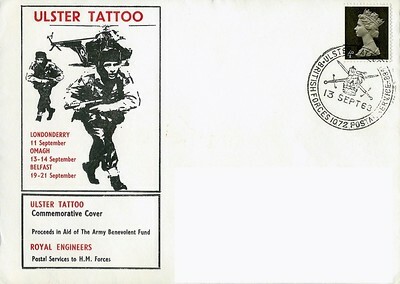 Special Handstamp: Ulster Tattoo 1968 BFPS 1072, 13 SEPT 68, British Army Emblem in the centre. 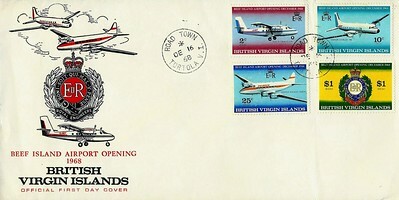 Beef Island Airport Opening 1968 British Virgin Islands Official First Day Cover The $1 stamp shows the RE badge. Stamps: Set of 4 British Virgin Islands commemoratives, Opening of Beef Island Airport, 2c, 10c, 25c & $1, issued 16 December 1968. 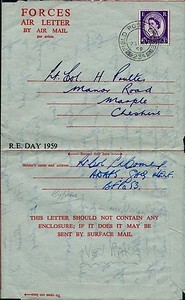 Circular Date Stamp: Road Town Tortola V.I. DE 16 68. See: Article published by "The Sapper" magazine. March 1969. Reproduced by kind permission of "The Sapper" magazine. See : Article published by "Gibbon Stamp Monthly". June 1969. Page 293, Page 294, Page 295, Page 296. 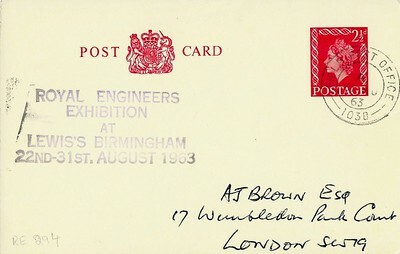 Reproduced by kind permission of "Gibbons Stamp Monthly"
Ulster Recruiting 1969 First Day Cover Stamps: 6 x "British Architecture Cathedrals" commemorative, 5ᵈ, 9ᵈ, 16ᵈ, issued 28 May 1969. Special Handstamp: Ulster Recruiting, BFPS 1085, Emblem of Ulster in the centre. Ulster Recruiting 1969 First Day Cover Stamps: 9ᵈ "St Paul's Cathedral" commemorative, issued 28 May 1969. Special Handstamp: Ulster Recruiting, BFPS 1085, Emblem of Ulster in the centre. Note: With the "Combat version" the top two photographs have the theme of "Combat" and "Transportation". 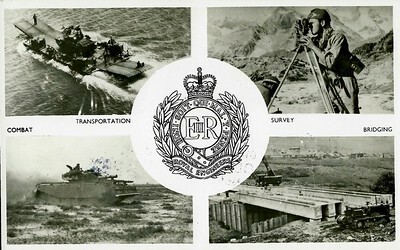 With the "Assault Bridging" version the top two photographs have the theme of "Assault Bridging" and "Mine Laying".